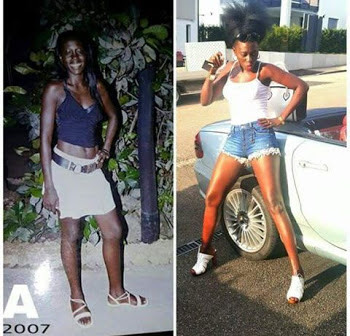 Money can make you look ‘petty’- here is Akothee’s photo back in the day, unbelievable! Akothee is arguably the richest Kenyan singer. She is known to lead a flashy and flamboyant life. If you look at her right now, you won’t believe the picture below. The ‘Djelle Djelle’ hit maker now looks adorable, and she is nothing compared to her pictures back in the day. Maybe money is her lotion. She is filthy rich and she doesn’t care. She shows off her wealth to the public and there is absolutely nothing anyone can do about it. She was once a village girl before she ‘hustled’ her way to the top. She is a mother of 5 and according to her story, she earned her wealth. It all her sweat.